If Todd has passed on it, I would prefer a beautiful nobody, like Tim or Sam Wood over another faux-lebrity. Make it so TPTB! This sounds like a firm no from Todd. Oh well. Maybe next year...? If not Todd then I'm with @Dirty Street Pie. Fresh meat please. Well this sounds promising!!! The girls have been cast and the show is going ahead but they haven't cast a Lead are hinting at a "desirable" NON celeb who's ready to settle down. Yes, yes, yes. From Jo Scrimshire too, who's usually on the money. 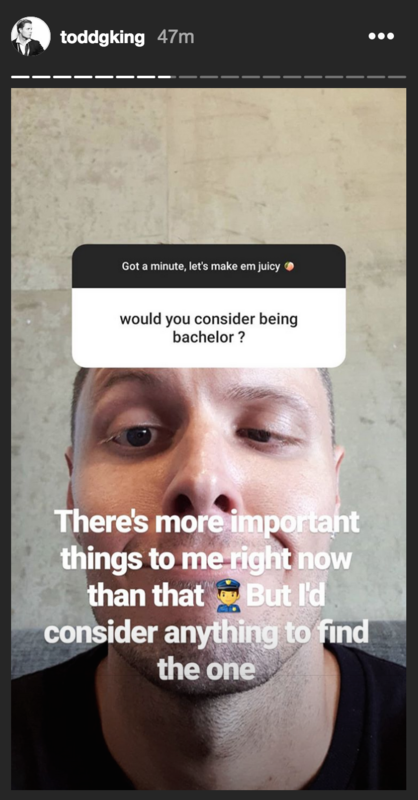 The Bachelor 2019 begins production in a month and Channel 10 still hasn't locked in a leading man. Channel 10's Head of Programming Daniel Monaghan told TV Tonight that producers are still searching for the perfect 'desirable' suitor. lsewhere in the interview, Monaghan strongly hinted that this year's suitor will not be a celebrity. 'The Honey Badger [last year's suitor, Nick Cummins] was obviously very noisy but we will steer in a different direction this year,' he added. Interestingly, Monaghan specifically said the female contestants have been cast, but not the male lead. He also spoke in the future tense ('we'll find a man') when discussing the casting of the suitor. This would strongly suggest that Channel 10 and producers Warner Bros. Australia have not yet confirmed a leading man - despite filming being just weeks away. Former Love Island Australia star Justin Lacko has also been mentioned as a possible candidate, but Monaghan said he wasn't right for the job. WOOT WOOT!!!!! a newbie then like a Sam wood or Tim Robens type YAY no celebrity (still hoping for Todd though) but this is great news! Classic DM. This journalist apparently missed yesterday's article quoting Ch 10's HEAD OF PROGRAMMING saying the lead will be a NON-celeb. Not to mention Chris Brown's currently filming IACGMOOH in South Africa and the finale won't be till late Feb... just days before Bach starts filming. Great news on the Non Celeb! O/T but I'm just watching MAFS ep 6 (a Ch NINE show) and when Michael and Martha kissed at their wedding reception THEY PLAYED F1 MUSIC!!!!! @Bobette wrote: O/T but I'm just watching MAFS ep 6 (a Ch NINE show) and when Michael and Martha kissed at their wedding reception THEY PLAYED F1 MUSIC!!!!! i laughed soooo hard when i was watching this last night! mafs and bach world collide ! maybe bach will be on nine?? @LeapofFaith wrote: i laughed soooo hard when i was watching this last night! mafs and bach world collide ! maybe bach will be on nine?? ME TOO! I was like... wait... what the... that sounds just like... O. M. G. it IS! Makes me think all the reality shows are in cahoots and making FOOLS of us all! I'd be genuinely interested to know the rationale behind using it. Is it like a Pavlovian response - play the F1 music and the audience will be subconsciously programmed to believe Michael and Martha are going to fall in love and stay together forever? Nice to see DM is still visit our forum in the off-season. Revealed: The very convincing fan theory that Married At First Sight's Martha Kalifatidis and Michael Brunelli WILL stay together - so did you notice the editing trick that gave it away? According to a very convincing fan theory, an editing trick used by producers may reveal that the couple are destined to be together. During their kiss on Monday night's episode, a familiar-sounding musical theme played in the background. Fans familiar with The Bachelor franchise will recognise this soundtrack as the so-called 'winner's theme'. The 'winner's theme' is an informal term for the romantic musical motif, often accompanying a first kiss, which is known to signal a contestant's eventual victory. This could simply be a coincidence, as MAFS is produced by the same company that used to make The Bachelor, Endemol Shine Australia. However, according to fans on The Bachelor and Bachelorette Spoiler Forums, it could also be a subtle clue that Martha and Michael stay together until the end of the season. Thanks to Jo Scrimshire for crediting the forum. ps Got any hot tips for us regarding the 2019 lead? Off seasons nearly over @Bobette girls have already been cast, we’re just waiting on our Bach!